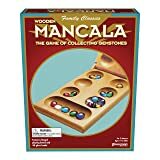 Mancala is a name given to a large family of "Pit and Seeds" or "Count, Sow and Capture" games - one of the oldest games known. 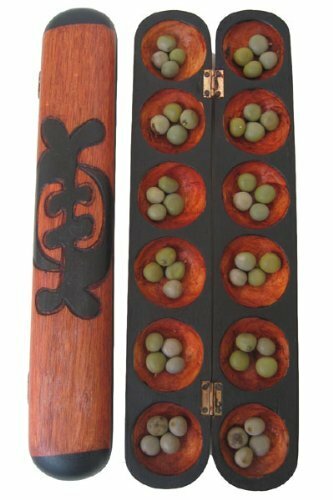 There are about 300 different Mancala games, some versions are simple like Kalah or Oware but others like Omweso or Bao can be very complicated as they are played on two boards and sometimes played in a reverse direction. Folding Wood board with 2 rows of 6 pits (holes). Players sit opposite to each other with the game board in between. The Mancala-board is made up of two rows of six holes or pits. The six small holes on your side of the game board belong to you. Each player places 4 stones (of every color) in each of his 6 pits. Your scoring cup or store (a.k.a. mancala) is to your right. 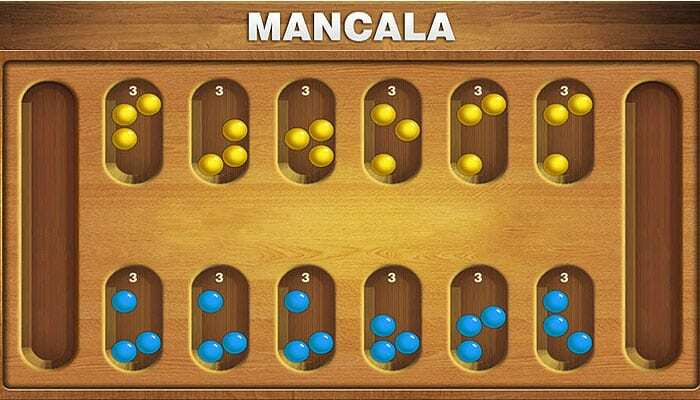 Have most stones in your mancala after all the stones on one side of the gameboard are captured. The starting player choose a pit on his side of the board and pick up all the stones. In a counter-clockwise direction, the player now deposit one stone into each pit. If you drop a stone into your own store, deposit it and that stone is safe. If you run into your opponent's store, skip it. If the last stone you drop is in your own store, you get a free turn. If the last stone you drop in in an empty pit, you capture the stones and any stones in the pit directly across from it on your opponent's side of the board. If you capture stones, place them directly in your Mancala (store). After you do dropped all your stones (and capture any stones,) your turn is over. The game continues with players alternating turns. How to Capture a Stone? Like said above: if you drop the last stone into an empty pit on your side of the board, you capture all of the pieces in the pit directly across from it on your opponent's side of the board. By dropping the green stone into the empty pit, you will capture the two stones (red and blue) on the other side of the board. Take now all 3 stones (green, red and blue) and place them in your store (mancala). It's ideal to open with your 3rd hole because now your last stone lands in your mancala. This score one point and enables you an additional turn. Now, you play your rightmost hole to score another point and drop your last stone into your opponent's 3rd hole (this blocks him to do the same). Check here for more detailed information about the best opening of Mancala. As soon as all the six pits on one side of the board have been emptied, the game ends. The player who has still have stones left on his side of the board will capture all of those stones. Player 2 has 3 stones left and can add them to his/her mancala. The players now count their stones in their mancala and the player with the most stones wins the game. The Rules in American commercial Mancala sets are actually for Kalah. Kalah was invented in 1940 by an American, William Julius Champion Jr. He started selling it in 1944, patented the design and rules in the 1950s and founded the Kalah Game Company in Holbrook, Massachusetts in 1958. Kalah is played on a 2 X 6 Board with a "Kalah" at each end. Players sow pieces around the board, including one into their Kalah as they pass. Cross captures are made when their last piece falls into an empty pit on a player's side, opposite an occupied pit on the opponent's side. A second turn is allowed when it falls into the Kalah. The game is won by captures. The game has no African origins despite many claims to the contrary, even by its inventor, because there is no such game in the whole of Africa.